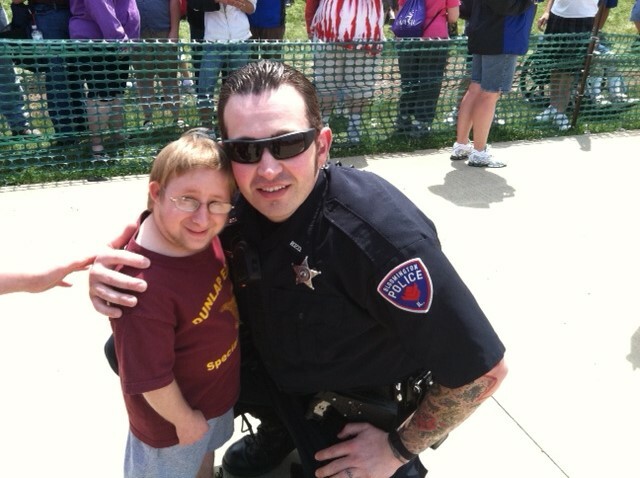 Drake Taylor of Dunlap has posthumously received the 2013 Special Olympics Illinois/Law Enforcement Torch Run Hero Award. Drake’s parents, Beverly and Randy Taylor, accepted the award at a reception held on June 14 before the Special Olympics Illinois Summer Games Opening Ceremonies at Illinois State University in Normal. 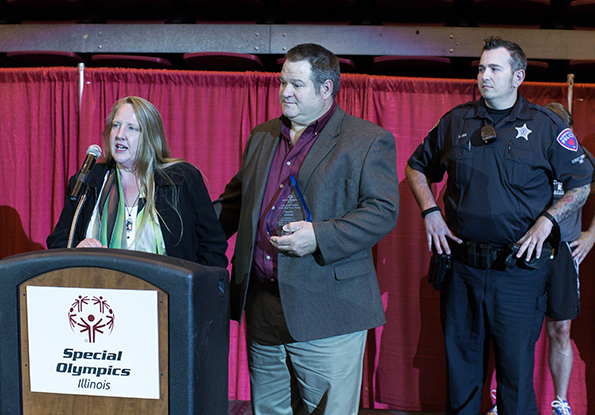 The Law Enforcement Torch Run Hero Award recognizes an individual involved in Special Olympics Illinois who has demonstrated courage, noble qualities and has been a model for others. This award exemplifies what a hero is, in the eyes of a Law Enforcement officer. Drake Taylor was such a hero. Drake passed away at the age of 18 on Nov. 28, 2012. Drake participated in Special Olympics with the Dunlap Eagles. He also participated with Best Buddies of Dunlap High School, Peoria County 4H, Central Illinois Riding Therapy and Little People of America. He loved animals, artwork and making jewelry. Throughout his life, he was courageous. He had to be – he had to stand tall in the face of giant odds. He displayed qualities that superseded his years and served as a model for others. He was someone to look up to for his drive, determination and for his outlook on life. Drake made an impact on the lives of countless individuals. This was demonstrated at a Special Olympics Illinois Basketball Individual Skills competition at the Shirk Center in Bloomington. During the event, Drake was determined to make a basket. He stood less than 3 feet tall, but was determined to shoot until he scored! He tried over and over and was asked if he wanted to try a shorter hoop. He told them, “No, I’ll get it.” Drake’s determination was mesmerizing; he continued to shoot the ball. Finally, out of nowhere, the ball went in. The crowd went crazy! Drake’s courage and determination resonated through the gym and within the hearts of everyone in attendance.